In the département of Alsace is the fascinating city of Strasbourg, a city without two countries. All of the signs are in French and German, and everyone there speaks at minimum those two languages, usually in addition to English. The city is most famous for the island of "Petite France," a UNESCO-protected site in the Ill River. Petite France is a conglomeration of medieval-style houses in Strasbourg where you can find the best Alsacien and French food in the city. In our time in the city we took two trips to the massive cathédrale made out of pink sandstone. The object of my quest in the cathedral was a huge solar clock that has been in more or less continuous function since the 16th century. It is a huge clock that keeps track of the trajectory of the planets along with the time and date. Strasbourgeoise culture is often said to be a mixture of French and German, but I saw a lot of pieces indicative of Swiss culture, as well. For example, Alsace is the département that exports the most chocolate in France, and the traditional garb of Alsace is very German-Swiss. The biggest time to go to Strasbourg is during Christmas/Nöel/Weihnacht. There is a huge festival celebrating the holiday, and it has the added advantage of being very near the best slopes in France for snow sports. As far as cuisine, Strasbourg has a taste all its own. Alsace is the production center for a few different kinds of wine, mainly Riesling, Gewurtztraminer, and Edelswicker. These are all white wines, and none are a blended variety as we had come to know them from Bordeaux. Riesling is one of the sweetest white wines you can find, which makes it perfect for a specialty of the region, Coq au Riesling, or cooked rooster in Riesling gravy. The other major dish to try in Strasbourg is Choucroute alsacienne, or Alsace Sauerkraut. It includes traditionally three or four types of sausage. A few other types of dishes are native to Alsace. In true Strasbourg fashion, one is know by both its French and German name, and you'll see it advertised as one or the other depending on the part of town you are in: flammeküche or tarte flambée. The easiest way to explain this dish is a sort of pizza without marinara, and usually a very specific selection of one or two specific traditional toppings including lardons, or chopped up, fatty bacon. Baeckeoffe is a kind of roast stew with carrots, potatoes, and white wine. 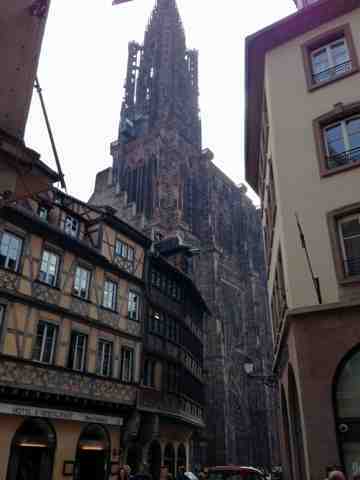 In all, Strasbourg is a fascinating city with a melangée culture and Franco-German styling. We had a lot of fun, and the Strasbourgeoise were very nice.